Using our unique aerosol interface, the SPAMS 3.0 instrument has been field demonstrated to analyze particles over a very wide range of sizes. In addition, our patented tracking system renders the SPAMS 3.0, to all practical purposes, immune from saturation with only the duty cycle of the laser governing the number of particles that can be analyzed per second. Read more about our technology in general in our technology section or about its particular application to tuberculosis in our literature section. 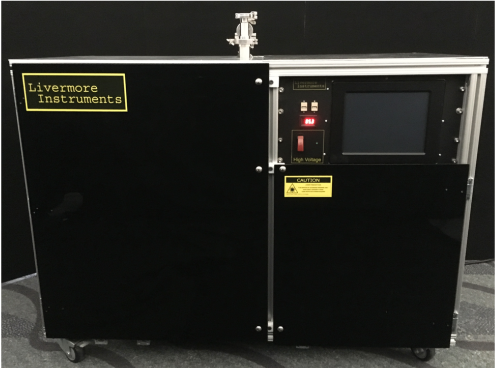 Livermore Instruments Inc. is a San Francisco Bay Area startup company dedicated to bringing aerosol analysis to nontraditional fields. We were spun off of Lawrence Livermore National Laboratory (LLNL) in mid-2008 to bring our technologies, developed for over twenty million dollars and the course of fifteen years, to the world. Our flagship product is the SPAMS 3.0 Single Particle Aerosol Mass Spectrometer. The SPAMS 3.0 sensor is capable of collecting and analyzing hundreds of mass spectra per second, each from an individual aerosol particle and analyzing the data in real-time to determine the origin and history of those particles. Our technology portfolio, licensed from LLNL, the University of California, Riverside, the University of Minnesota and developed internally, includes field-leading aerosol analysis technologies that make real-time aerosol detection practical. We also allow the extremely simple collection of many mass spectra from real-world samples very rapidly, whether those samples are inherently in the aerosol phase or are aerosolized deliberately. Our instruments were designed from the beginning for ease of operation and maintenance. SPAMS sensors have already been deployed to harsh environments including one experiment where 10,000 pounds of rocket fuel were combusted and another where 800 pounds of high explosives were detonated, in each case only 100 feet away. The SPAMS sensors continued to operate, collecting data in both cases. If interested in the SPAMS 3.0, please click here to learn more about our technology or here to contact us.